A loud wail rented the still summer air. Rushing out into the courtyard, Md. Abu Taher's heart lurched in his chest as he came across Hanif, his infant son, clutching his eyes and writhing in pain. The child's parents did their best to soothe his agony, but to no avail. Soon an opaque white film obscured the child's irises. 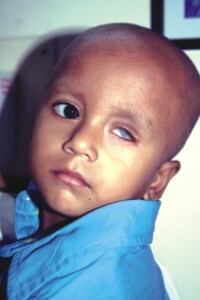 Hanif, suffering from congenital blindness was rapidly losing sight. The incident was an eye-opener for his parents they realised that their son was going blind. The next few months went by in a flurry of visits to the village clinic and a host of doctors, but no one could offer any help. Abu Taher grew increasingly dejected as he watched his child flounder around the house, unable to see. His quest to restore his son's sight led him to Islamia Eye Hospital in Dhaka, and the cure, corneal transplant. Thus began Abu Taher's tryst with Sandhani International Eye Bank.